Satya Art Gallery, Navjivan Trust, b/h Gujarat Vidyapeeth, Ashram Road, Ahmedabad. 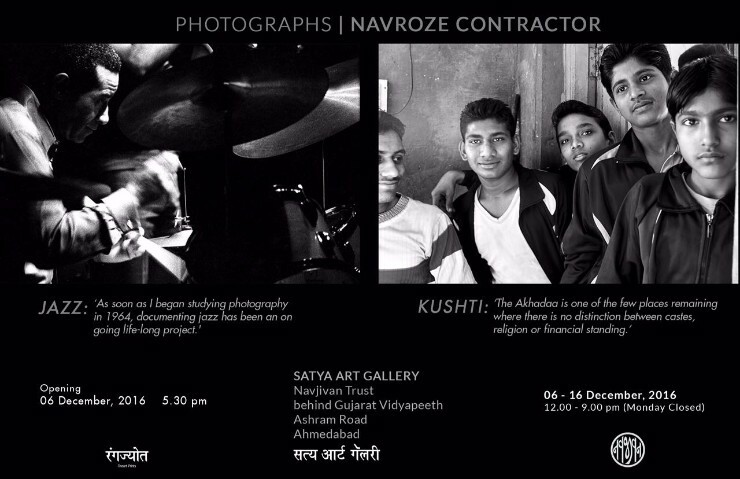 Navroze Contractor studied in Ahmedabad at Shreyas High School. He obtained a BA (Fine Arts) degree in painting and photography at the Faculty of Fine Arts, M. S. University of Baroda. His interest in cinema took him to the Film and Television Institute of India, Pune where he studied direction and cinematography. He studied photography with Bhupendra Karia and advanced cinematography with Laszlo Kovacs (famous for shooting EASY RIDER) in USA. He further studied Video Production at Sony Corporation, Tokyo, Japan. Navroze has been the cinematographer for many award winning feature films. Some of them are; ‘DUVIDHA’ (not just first feature film, first film) directed by Mani Kaul, ‘22nd JUNE 1897’, ‘LIMITED MANUSKI’ and “DEVI AHILYA BAI” directed by Nachiket Patwardhan, ‘PERCY’ directed by Pervez Merwanji, ‘LOVE IN THE TIME OF MALARIA’ directed by Sanjiv Shah, and ‘DEVARKADU’ directed by Pattabhi Rama Reddy. He shot ‘FRAMES’, directed by Chetan Shah, the first feature film in India to be shot entirely on High Definition format. He has had five one man shows of his still photographs: one in Bombay, two in Bangalore and two in San Francisco, USA. His photographs of jazz musicians are in the collection of the Smithsonian Museum, Washington DC, USA. His photographs of artist Bhupen Khakhar are in the collection of Tate Modern, London. He has taken photography and film workshops at the School Of Architecture, Ahmedabad, NID at Ahmedabad, IIM in Bangalore, IIT Hyderabad, SRFTI Kolkata, Pomona State College, California, USA and at the University of the Andes at Merida, Venezuela. He particularly enjoys taking photography, film and art workshops with primary school children around India. His love for motorcycles has taken him riding in Asia, Australia, South Africa, Europe, Thailand, Vietnam, Canada and USA. He initiated a team of three riders, including him, who circumnavigated India on motorcycles in 2005, covering over 18500 km in 57 days. He writes regularly as ‘Editor at Large’ for CAR India/BIKE India and contributes to several other magazines. Presently he is involved in several still photography and documentary film assignments.